If you follow me on social media, you'll know that last week I was lucky enough to be in Cincinnati - and it wasn't just because each day I was there was 34 and sunny, while Toronto dealt with 15 and rain. I was able to join the American Pampers Baby Board to learn more about diapers and the AMAZING things coming this year from the brand. 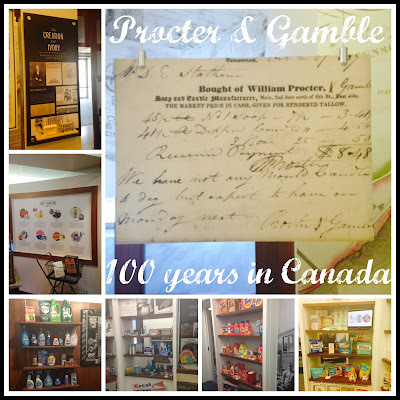 While in the hometown of Procter & Gamble, we also visited P&G Headquarters and got to visit the Archives and learn all about how Procter & Gamble started. William Procter, a candle maker, and James Gamble, a soap maker, married the Norris sisters. Their father suggested that the men go into business together and Procter & Gamble was born. Have you wondered why it's Procter & Gamble and not Gamble & Proctor? It's because Procter was more established and already had stationary so Gamble just added his name with a pen. Do you know which brand was P&G's first? That would be Ivory - a soap marketed for both washing body and laundering clothes. By entering the following contest you are accepting that if you win your contact information will be shared with a P&G PR and shipping agency for the purpose of mailing your prize. Please allow 4-6 weeks from the contest closure date to receive your prize. This giveaway may appear on other blogs as part of the #PGmom program. However, to be fair, you can only win once per giveaway. If your name is chosen more than once, another winner will be selected. All winners must be from within Canada excluding Quebec. Valid entries only. Contest ends June 28th, 2015. For further contest rules, refer to the Terms and Conditions within the Rafflecopter. Ivory soap was the first product produced in 1916 - now that is a longlasting product!! wow! When they were 1st established 100 years ago, they employed 75 people. I learned that Ivory Snow arrived in Canada in 1932. I learned that P&G was started back in 1915. I love how in 1972 parents rejoiced over disposable Pampers! Very cool. That all of these products have been around for a lot longer than I thought. I learned that the company began in 1915 with 75 employees. I learned that P&G began in 1915 with 75 employees. Wow! I did not realize these iconic products have been around for so long. Tide was introduced in 1948. I cant believe Head & Shoulders has been around for over 50 years! Disposable Pampers were rejoiced in 1972. I learned that Always arrived in Canada in 1984. Wow, I thought it was much earlier than that! Ivory soap was the first product for P & G! Pampers since 1972 - awesome! I learned that ALWAYS arrived in 1984! I learned that they were incorporated in Canada in 1915. The year that all these products were introduced. I learned that Pampers was introduced in 1972. They have been around for 100 yrs~~~ WOW! Been around since 1915...Love that! I have learned that you know a product is great when it's been around for nearly a century like Ivory Soap. That speaks to it's quality and appeal to generations of P&G consumers. That Ivory Soap has been around for forever, or at least 99 years. WOW. In 1932 ivory soap arrives in Canada. I learned that Tide was introduced internationally in 1948. I learned that the company started out with only 75 employees. That Tide was introduced in 1948.
that P&G was started back in 1915. I learned that Ivory Soap was the first product produced in 1916 and I am glad it stayed around this long because it's one of my all time favorites! I learned that Ivory is their oldest product... still use that one today! That P&G started 100 years ago in 1915! WOW!! I learned that they started in 1915. I learned that Pampers was the first disposable diaper. That they were first established 100 years ago. I learned that there is an Oxydol detergent. I never heard of that before! I learned that Tide was introduced internationally in 1948! Wow! I learnt that ivory soap has been around longer then I have been. Tide has been around since 1948, wow!